1+2=3: I went out with NO KIDS!!! These are my lovely friends that I hadn't seen in a while. 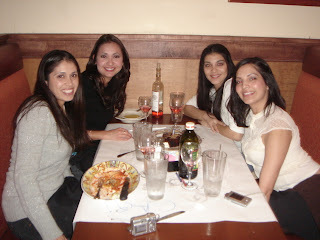 We went out to dinner for Susy's Birthday. It was so nice to see them all and get to have some girl talk. I think we pretty much caught up on everyone's life. We are planning on getting together again next month, and I really hope we do. It was not hard to leave the twins since my Mom, Aunt, Sisters, and Luis were all home when I left. Luis said after everyone left Lili did not want to drink her bottle and cried. I think her tooth that is coming in (#6) was hurting her.